François de Neufville, 2ème duc de Villeroy (7 April 1644 – 18 July 1730) was a French soldier. Villeroy was born in Lyon into noble family which had risen into prominence in the reign of Charles IX. His father Nicolas V de Neufville, marquis de Villeroy, Marshal of France (1598-1685) was governor of the young King Louis XIV who later made him a duke. François was brought up in close relations with Louis XIV and became a member of his inner circle. As a young child, he played with the King and his younger brother the Prince Philippe in the Palais Royal (home of Louis XIV and his mother Anne d'Autriche) and the nearby Hotel de Villeroy (home of the young François de Villeroy and his father the governor Nicolas V de Villeroy - the historic Hotel de Villeroy is located 500 m walking distance from the Palais Royal on 34 rue des Bourdonnais / 9 rue des Déchargeurs). Even though Francois de Villeroy was 6 years younger than Louis XIV they were friends, probably because the young Louis XIV enjoyed the role of protector to a younger child. An intimate of the king, a finished courtier and leader of society and a man of great personal gallantry, Villeroy was marked out for advancement in the army, which he loved, but where career soldiers had always a juster appreciation of his incapacity than Louis. In 1693, without having exercised any really important and responsible command, he was made Marshal of France. 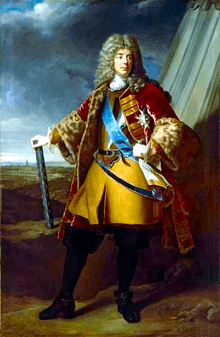 In 1695, when François Henri de Montmorency-Bouteville, duc de Luxembourg died, he obtained the command of the army in Flanders (see War of the Grand Alliance); William III found him a far easier opponent than the "little hunchback" (the duc de Luxembourg). Villeroy was responsible for the senseless bombardment of Brussels in 1695, which occasioned its reconstruction in the 18th century giving it the regularity and unity of architecture seen today (although it was again damaged in both World Wars). In 1701 Villeroy was sent to Italy to supersede Nicolas Catinat and was soon beaten by the inferior army of Prince Eugene of Savoy at Chieri (see War of Spanish Succession). In February 1702 he was made prisoner at the surprise of the Battle of Cremona. In the following years he was pitted against the Duke of Marlborough in the Low Countries. Marlborough's own difficulties with the Dutch and other allied commissioners, rather than Villeroy's own skill, put off the inevitable disaster for some years, but in 1706 Marlborough attacked him and thoroughly defeated him at Ramillies. Louis consoled his old friend with the remark, "At our age, one is no longer lucky," but superseded him in the command, and henceforward Villeroy lived the life of a courtier, and although suspected of being involved in plots, maintained his friendship with Louis. During this time, his secretary was Pierre-François Godard de Beauchamps. Under the Régence Villeroy was governor of the child King Louis XV and held several other high posts between 1717 and 1722, when he fell in disgrace for plotting against Philippe II of Orléans, the regent for Louis XV, and was sent to be governor of Lyon, virtually in exile. His family suffered a further disgrace when two younger members, the duc de Retz and the marquis d'Alincourt were exiled for having homosexual relations in the gardens at Versailles. Louis XV recalled Villeroy into high office when he came of age. Villeroy died in Paris in 1730. 1 2 3 4 One or more of the preceding sentences incorporates text from a publication now in the public domain: Chisholm, Hugh, ed. (1911). "Villeroi, François de Neufville, Duc de". Encyclopædia Britannica. 28 (11th ed.). Cambridge University Press. pp. 85–86. ↑ The Man Who Would Be King: The Life of Philippe d'Orleans, Regent of France by Christine Pevitt. Published by Weidenfeld & Nicolson in Great Britain, 1997. Page 301.